I got my Samplesource Free Spring Sampler Pack earlier this week! It was packed full of samples including Dove Shampoo & Conditioner, Pure Protein Crunch Chocolates, Hershey's Caramel Cookie Chocolate, Sensodyne toothpaste, Sunlight dishwasher pod and more. I was disappointed to see the Schick Hydro Silk razor missing as well as the Nescafe coffee samples, even though I was offered it when I ordered the sampler pack. Be sure to also look over the coupons that you get in your sampler pack too. I had a coupon for a Free Catelli Pasta and Breton crackers. Wondering what Samplesource is? Sampleource is a Free sampler pack program, it's free to join and they have Free Sampler packs that go live twice a year once in the spring and once in the fall. The exact day and time is not announced but I always check around the date and let all our readers know when they are available. You can read more about Samplesource in our Samplesource FAQ post here. Some people are still waiting for their Sampler packs to arrive, you can track your order here. 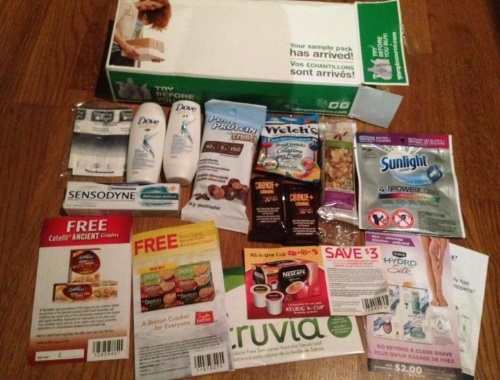 Did you get your Samplesource Sampler Pack? Let us know on our Facebook Page.